Unreleased Tomb Raider for Genesis, Duke Nukem 3D and other secrets behind TecToy ( EXCLUSIVE Interview). 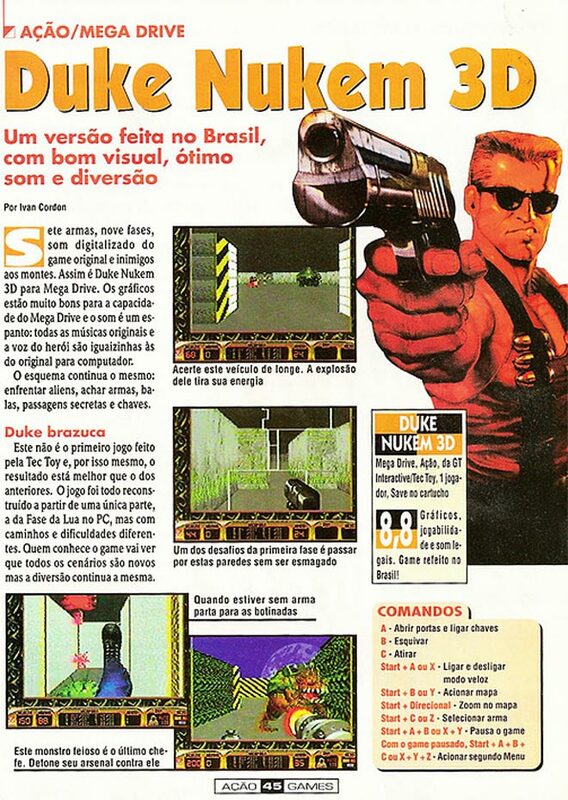 Last week, SEGA Nerds published an article talking about Duke Nukem 3D for SEGA Genesis. However, we wanted to go further and we found the designer who worked on this game. Daniel Trevisan is an ex employee from TecToy who told us a lot of secrets about how this game was made, as well as new information on an unreleased Tomb Raider game for SEGA Genesis. Daniel Trevisan Designer who made Duke Nuken 3D for Sega Genesis. Good morning Daniel, we are very happy to make this interview with you, everyone who love Sega greatly admire the work that was done by TecToy, and doing an interview with someone who was part of that is very special. First of all who are you? Where you are from? What do you do in your life? Daniel Trevisan, born in São Paulo – SP and currently living in Balneário Camboriú – SC. My main background is graphic design, I have expertise in visual and multimedia creation, I also have training in communication design, scenography, video editing, 2D and 3D animation, I also have an international certification in coaching and mentoring. Currently, I’m working with the sum of knowledge mixing arts and design with mentoring and coaching. I create tools that assist in self-awareness and leadership of people, groups and businesses. I created the WELL-BEING DESIGN concept, which operates in the construction of happiness of human beings through behavioral knowledge combined with communication in the visual arts. 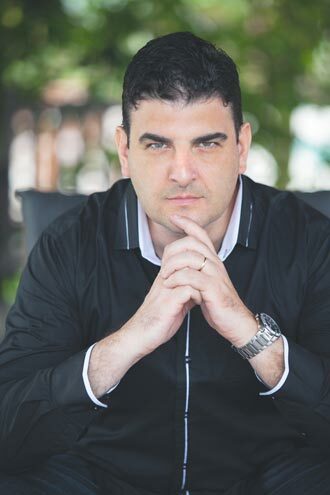 During my professional life I developed games, participated in exhibitions of visual arts, created visual identity and virtual scenarios, I was responsible for designing animation and editing for major TV stations in Brazil, in addition to teaching various subjects in the communication area in universities from São Paulo. What’s your favorite SEGA game and console? With no doubts, Duke Nukem 3D and the platform our beloved Genesis. Duke Nukem for having managed to realize a dream of building a game from scratch and Genesis to be part of my teenage years. How and when did you start working at TecToy, and when did you leave? I started at TecToy in April 1997, through an ad on the wall of my university to work with games; It was the dream of many young people at that time. I was advised to give up the job, as more than 300 students had already applied for it. I didn’t care and decided to give it a chance, I already had a good knowledge in design and computer, and really believed in my potential. I remained in this company for almost two years. What games have you worked on TecToy? What was your role in each one of the games? I worked on the Street Fighter game – Master System as Tester, Phantasy Star 3 as a Translator and Tester, Sítio do Picapau Amarelo – Master System as Developer and as a Designer for Duke Nukem 3D – SEGA Genesis. Any idea or canceled game we do not know? Well, at that time due to the success of Duke Nukem 3D, we started to develop Tomb Raider for Genesis, but Tectoy filed for bankruptcy and sent several talent away. They started just to import and resell games. Then I asked resignation because I was invited to work in a TV station. There wasn’t more opportunities for creation there. How was the relationship between TecToy and SEGA? Did they have to approve everything, or could TecToy do whatever they want and release it? Did they help in the process (documentation, Assets, Arts, other things)? Did they always give feedback for all the projects? It depended of the agreement, each game had a characteristic, in the case of Duke Nukem had a lot of freedom to recreate the game, bringing their concepts from PC lunar stage. SEGA had its strict quality control and after the development of any title, was infinitely tested by the staff of TecToy and the next phase by SEGA staff. Everything was analyzed, from gameplay, visuals, sounds, content adaptation, making it adequate to the public. The feedback was constant. However, other games were just adaptations and even then had to be relentlessly tested to avoid any bug. Making Duke Nukem run on a SEGA Genesis must have been insane work when they came with the idea of the game for you. Did you already have in mind about making a game with 3D perspective, or it was decided later? It was really insane at the time because it was seen as almost impossible to work. It would need to be in 3D, bringing two-dimensional aspects to this game would totally disqualify the proposal. It was very tense, the pressure was constant and we had to develop short-term own tools to build it. I have to highlight two professionals who were partners on this process: Heriberto Martinez Mandique who worked on the sound, and 3D engine and Maurice A. Guerta who developed the tools . I had the pleasure of working with these fantastic companions without their technical capacity, we could never accomplish this challenge without them. Finally, joining the knowledge of each area we could find a solution and communicate in a timely manner responsible for the viability of the game in the market. How was the process in development? Did you have a lot of problems? Is it true the team used a Phantasy Star algorithm? It was a lot of work. When we found a solution, deadlines were already very short and we had to make the methodology into practice as soon as possible. We used the languages like C and Assembler as well as many calculation tables using log and ant-log of sine and cosine functions to accelerate the process of multiplication and division without using a mathematical processing CPU. Heriberto and Mauritius used BSP algorithm (binary space partition) to link many areas (indoors) through the hollowed walls. This algorithm was very different from 2D and a half used in earlier versions of this platform. It made it possible to create walls and doors with thickness and with rectangular variable dimensions and not only as the square Wolfenstein game. I used a Cartesian plane system to map the whole game, from then on, we began to applying textures and strategies of Duke Nukem 3D. Each level had to be with progressive difficulty and at the same time interesting to the user. Creativity had to be present in every password or secret passage, the personality of the enemy and in the combination of every animation, audio and scenery. We also created a quality roadmap to consolidate an effort of three talking heads. Yes, the Duke Nukem 3D for Mega Drive was made from scratch and developed by three professionals: Two engineering and design. I recently heard someone saying that Duke Nukem 3D was made from the Phantasy Star. I don’t know why he did this statement, since there were no connections between the two games. None at all! Maybe who he said that doesn’t remember how it was done or even the talent he had in this company, unfortunately. Design of the Duke Nuken 3D maps for Sega Genesis. How long did this project last? To create the authoring tools, design and testing, about a year. How was the feedback from SEGA when they saw Duke Nukem 3D running on the SEGA Genesis? It was a great surprise, we received an email from SEGA classifying the game as AA, which is the maximum score achieved in a game for the Mega Drive platform and a congratulatory comment for having achieved something that even SEGA wondered if it was possible. Moreover, it was matter of specialized magazines of the time. It was something exciting where three Brazilians developed with little technology and a lot of pressure, something that would be amazing so far. 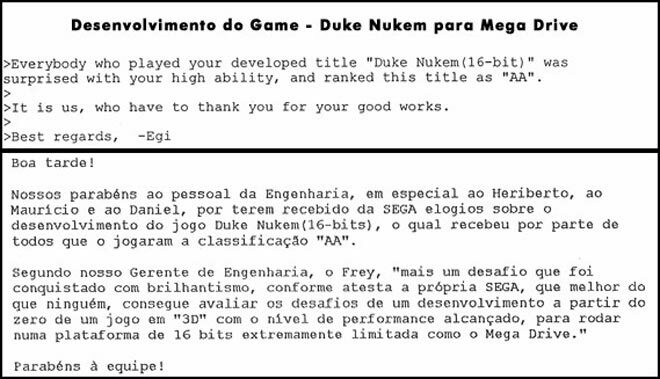 Congratulation to the people from the engineering department, in Special Heriberto, Mauricio and Daniel, for having received compliments from Sega about the development of the Game Duke Nuken (16-bits), which received for everyone who played the classification “AA”. brilliance, as shown by Sega, that knows more than anybody, how to evaluate the challenges of develping a game from scratch in 3D with the level of performance acchieved running on a platform 16-bits extremelly limited as Sega Genesis. In 2015, the company Piko Interactive relaunched the game worldwide. Do you feel proud that even after so many years there is still demand for the game? I feel extreme fulfillment and a sense of accomplishment, and ready for new challenges. No wonder, because the love that was put in the development of this game only tends to give good results. I remember having worked on Christmas Day and New Year’s Eve! What is done with care and quality remains. Knowing that now a project in which you participated so intensely, belongs to the world is the best feeling you could feel. After 20 years I am thrilled! Daniel ,thank you for the interview. Lastly, do you have any message for someone who is starting now with game design? Never give up is the first thing, the second is to love very, very much what you do, the third is not limiting yourself to creating games in front of a computer. A professional should study hard and have a systemic view of the work. It’s not limited in what the software or programming gives you, the secret is to explore what is out of the computer universe, know how to create is to look at nature and see different painting techniques and illustration; It’s to feel the movement of a walk and the flow of people who are around you. 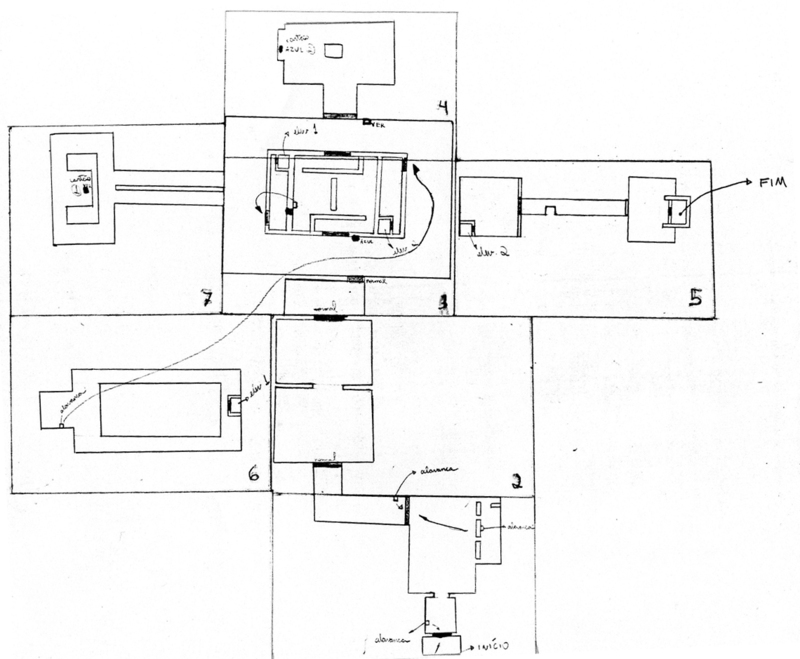 The design of a game begins long before digital effects and advanced plugins. I developed the Digital Art Therapy ©, it’s a tool that works WELL-BEING Design concept mentioned above, many studies I used from the time when I developed games. Currently, I help people in changing mentality and exercise leadership in business, adding knowledge of that time in other areas. The different professionals need to have an open mind to new possibilities and applications of their skills.